More than 2,000 people took on the challenge of completing the 12th Mersey Tunnel 10k race on Sunday. The event, which is organised by BTR Liverpool, was due to take place on its usual date in June, however major transport works in the local area during the first six months of 2017 meant that this was not possible. Event organisers offered refunds to anyone who signed up for the original date, but could not make it to the rescheduled one. This year’s race was won by Ian Lawton from Mersey Tri with a time of 33:30. Dan Morgan was second in 34:54, with Ciaran Gavin from West 4 Harriers claiming third place in 36 minutes 10 seconds. Taking the female honours was Kirsty Longley from Liverpool Pembroke Sefton Harriers with a time of 36:49 – setting a new female course record. Phillipa Williams from Bristol University Cross Country was second in 38:24, followed by Carmel Triggs in a time of 39 minutes 39 seconds. The race conditions were wet and breezy along the route, offering a cool and comfortable temperature for the race goers. 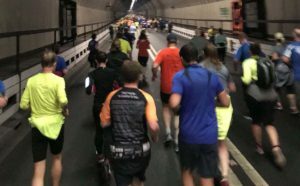 After starting on Blackstock Street in the city centre, runners made their way into the Kingsway Tunnel before beginning the gentle one-mile descent under the River Mersey. Runners supported each other during the dreaded ascent up to the exit by singing iconic Liverpool anthems such as ‘Hey Jude’ to help spur everyone on. 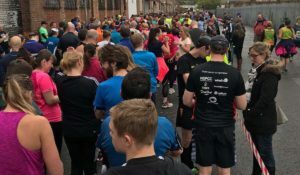 After the tough uphill climb out of the tunnel, participants left via the emergency exit prior to the toll booths, before heading onto Oakdale Road and then the halfway point water station at the car park behind the Mersey ferry terminal on Birkenhead Road. The second half of the race took runners alongside the River Mersey from the Wallasey ferry terminal all the way to the finish line at New Brighton. For those who want to sign up for next year’s race, entries are now open for the 2018 Mersey Tunnel 10K race, with a provisional date of April 15th, meaning it will take place a week before the London Marathon.